Created by Melbourne based designer Helen O'Connor in 2006, Thurley was brought to life following O'Connor winning … read morea scholarship at the prestigious Fashion Institute of Technology in New York. The brand's debut collection at L'Oreal Melbourne Fashion Week was met with glowing reviews and cemented their place in the Australian fashion landscape. Today stocked in premium retailers across the globe, it is Thurley's beautifully embroidered evening wear and dedication to detail that sets the brand apart and ensures that their flattering, modern yet timeless designs are staples in the contemporary woman's wardrobe. The Freya Fringe Dress is a flowy, asymmetric piece. Features beautiful detailed lace and a bell sleeve. The long awaited Thurley Ballet Russes Dress is finally here! The Ballets Russes Dress is one of the stand out pieces of the season. The dress features hand beaded mesh and fringe hem trim. This dress is a limited edition Thurley collectable that can be treasured for years to come. Ivory has been sold out Australia wide. Perfect for your special event. Consider this dress as your engagement party dress, pre-wedding celebrations or perhaps something more fun to slip into post wedding ceremony! Think hens, your baby's christening, the upcoming spring carnival races. The Ballet Russes dress by Thurley, in Ivory will ensure you impress at literally any event. The Thurley "Moonshine" Dress features a flattering front and back V-neck, fringe texture, and a tiered mini baby doll silhouette. Featuring a very special French boucle that has been cut by hand to create the fringe trim comprising of silvers, blues and whites this dress is visually stunning and very flattering on the body. Perfect for weddings and races we would team this with silver strappy heels and your are ready to dance the night away. * Please note that this dress is a larger size 8 so if you are on the smaller side it will be too big. Classically sweet florals make the Thurley Vasette Lace Mini Dress a keepsake piece. Patterned with delicate floral embroidery in warm, springtime hues, this lace mini features sheer lace sleeves and a scalloped bottom hem for a charming and feminine silhouette. This very special piece features an exclusive Thurley embroidery appliqué, tiered brodarie skirt and sleeve spliced with lace. The linen fabric lends versatility and wearability to the piece, making it suitable for day or night occasion. New season Thurley has arrived! This piece features exclusively printed broderie anglaise cotton fabric. This signature Thurley silhouette has a tiered full skirt and sleeve. Perfect for a lunchtime event or winter wedding! This piece features exclusive Thurley printed silk yoryu, a signature tiered circle skirt and fashion forward peaked shoulder. The bodice, waist and cuff has been spliced with a hand-beaded trim. This Thurley signature style is perfect for any occasion. The Thurley Folklore Chintz Dress had been created in a printed cotton broderie analgise and features a dual tiered skirt, puff sleeves and a fitted bodice. This dress is perfect for upcoming Autumn weddings and looks gorgeous when paired with a tan heel and gold jewels. Also available in a Ivory Chintz colourway. The Flora Climber Dress has a captivating delicacy and innocence. 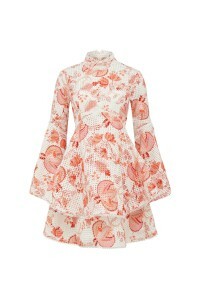 This baby doll dress features bell sleeves, embroidered fabric and an oversized fit. Model wears size AU 10. Dress has a generous fit. Size AU 10 will fit size AU 8-12. Thurley is one of Australia’s most coveted designer labels, offering intricate detailed event dresses and beautiful wearable separates. Creative Director Helen O’Connor consistently excites and inspires Thurley’s cult following with collectable, classic and modern pieces. The Seven Seas Mini Dressis a stunning piece formed in embroidered linen and spliced with a customer Broderie Anglaise trim. Extra beautiful details such as a spliced lace up bodice add eye catching decoration making this perfect for a summer party. Our model is wearing a size 8 dress. Our model usually wears a standard size AU8/Small. She is 179cm tall with an 81cm bust, a 66cm waist and 91cm hips. Our fave new arrival from Thurley! The Olympia Midi Dress has been created with a series of lace panels engineered to wrap around the body and accentuate the décolletage, waist and hips with fishtail skirt. Each featured panel has been hand sewn with rings and beads.